MADE OF "HARD ALLOY, NON-MAGNETIC 7075 ALUMINUM" IN THE USA! Akai M-8 / M8, X150D, X-150D, 1700, 1710, 1710-W, 1710W, 1710W/L, 1720, 1720W, X-2000S, X-2000SD & X-5000-W models and Robert's model 720A, 997,1630, 1680, 1725 8L III and maybe others . This allows the faster, better quality, 7.5 ips playback / recording speeds to be achieved. Without this you will only be able to do the slower speeds of 1 7/8ips and 3 3/4 ips (while some of these decks were originally designed to play 15ips as well, this required a '15 ips kit' which had an 'optional', additional and different speed sleeve and a smaller pinch roller. 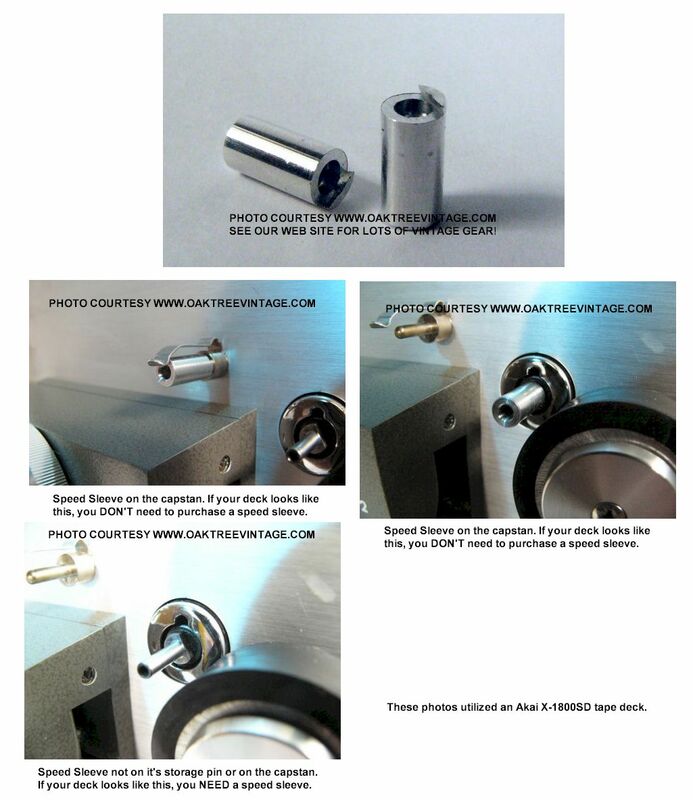 At this time we are not manufacturing either the 15ips sleeve nor is there a source for the smaller 15ips pinch roller). If yours is misplaced then here's the fix. 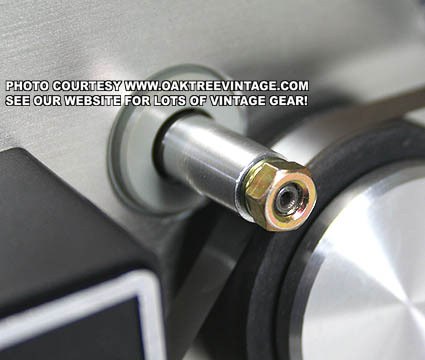 These are new speed sleeves machined to exact specs and made of "HARD ALLOY NON-MAGNETIC 7075 ALUMINUM", not soft brass, that has a short life, so the locking dovetail will not wear. 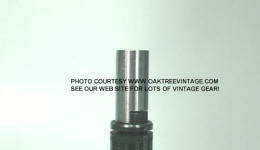 These fit snug and will stay on with a perfect fitting "locking notch" joint machined to perfection. Each one is individually tested with factory test tones at 400Hz and 1kHz, and monitored on an HP, dual trace O'scope for any wow and flutter issues! (includes Postal 1st Class shipping to any of the US states. These enable you to play / use the faster 7.5 ips tape speed if your deck requires a capstan sleeve to do that. We are always investigating which Akai Reel decks these will fit. We do know it will fit the above listed decks. If you do not see yours listed PLEASE DO NOT EMAIL or CALL to ask if it will, as we do not know yet. This is a "work-in-progress". As soon as we discover additional models that this sleeve will or will not fit, we will post that info. STUDY THE PHOTOS CLOSELY TO DETERMINE THE FIT FOR YOUR DECK. We know these do not fit X-4000D, 4000DB, 4000DS, 4400 or some of the "M-" series as they use a different sleeve. Akai M-9, 1800 series, X-1800SD, 1800-DSS models and Robert's model 770X SS, 771X SS and maybe others . This allows the faster, better quality, 7.5 ips playback / recording speeds to be achieved. Without this you will only be able to do the slower speeds of 1 7/8ips and 3 3/4 ips. These enable you to play / use the faster 7.5 ips tape speed if your deck requires a capstan sleeve to do that. We are always investigating which Akai Reel decks these will fit. We do know it will fit the above listed decks. This is a "work-in-progress". As soon as we discover additional models that this sleeve will or will not fit, we will post that info. STUDY THE PHOTOS CLOSELY TO DETERMINE THE FIT FOR YOUR DECK. 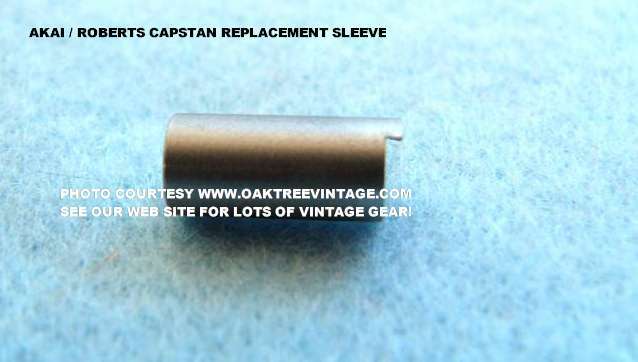 This is a new 15ips capstan bushing / speed change sleeve / adapter for certain Akai & Roberts-Rheem Reel to Reel Tape decks. HOWEVER, NOTE; YOU WILL NEED THE ORIGNALLY SUPPLIED, SMALLER DIAMETER RUBBER PINCH ROLLER TO ALLOW CLEARANCE WHEN MACHINE IS IN 'STOP' MODE. WE DO NOT HAVE THE RUBBER PINCH ROLLERS AVAILABLE, ONLY THE METAL 15IPS SLEEVE. Akai M-8 / M8, X150D, X-150D, 1700, 1710, 1710-W, 1710W, 1710W/L, 1720, 1720W, X-2000S, X-2000SD & X-5000-W models and Robert's model 720A, 997,1630, 1680, 1725 8L III and maybe others. This allows the fastest speed of 15 ips playback / recording (or potentially 30ips playback / recording speeds on the Akai GX-365D) speeds to be achieved so if you have tapes recorded at 15ips, you can now play them back correctly. Also, if you are making new recordings and want the best quality sound possible, then increase the 'writing' / recording speed to 15 inches per second. This sleeve will allow that. 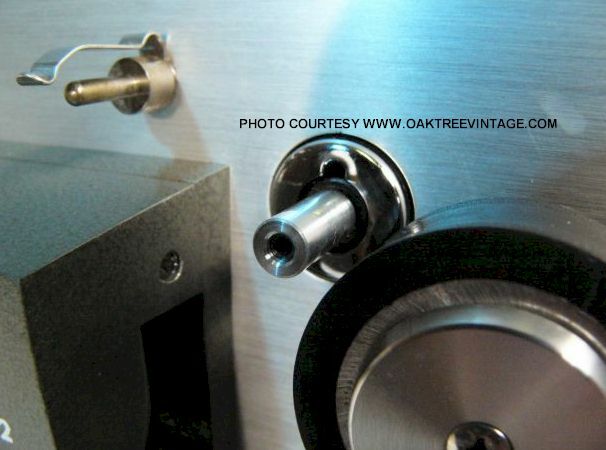 These enable you to play / use the faster 15 ips tape speed if your deck requires a capstan sleeve to do that and YOU ALREADY HAVE THE SMALLER 15IPS RUBBER PINCH ROLLER, OR HAVE A SOURCE FOR ONE, OR HAVE 'FILED DOWN' AN ORIGINAL. We are always investigating which Akai Reel decks these will fit. We do know it will fit the above listed decks. This is a "work-in-progress". As soon as we discover additional models that this sleeve will or will not fit, we will post that info. STUDY THE PHOTOS CLOSELY TO DETERMINE THE FIT FOR YOUR DECK. MADE OF HARD ALLOY, NON-MAGNETIC 7075 ALUMINUM" IN THE USA! Akai GX-365D, 3000D, GX-4000D, X-4000D, 4000DB, 4000DS, 4400 and Roberts 450 & 990 reel to reel decks and possibly others. This allows the faster 7.5 ips (15ips on the GX-365D) playback / recording speeds to be achieved. Without this you will only be able to do the slower speeds and won't be able to achieve the higher quality recording / writing speeds of 7.5ips. 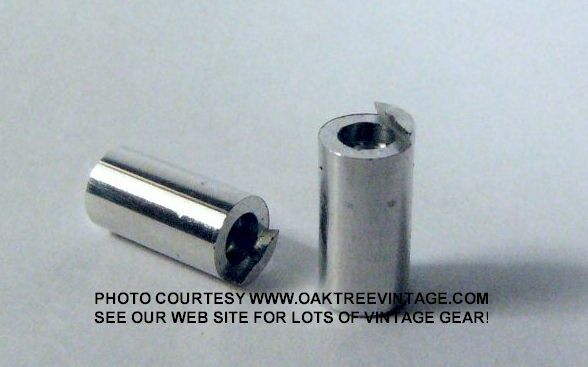 These are new speed sleeves PAINSTAKINGLY machined to exact specs and made of "HARD ALLOY NON-MAGNETIC 7075 ALUMINUM", not soft brass, that has a shorter life. Included Hex nut and Washer now made of 'Non-Magnetic', 'Stainless Steel' (not currently in photos above). *While the original style of 'top nuts' are not available, nor currently practical to manufacture, we are now including a 'hex nut' and lock washer that, while lacking in the cosmetics of the original, does function fine. You typically do not need any tools to tighten or loosen as fingers usually do the trick. These sleeves / speed adaptors enable you to play / use the faster 7.5 ips tape speed if your deck requires a capstan sleeve to do that. We are always investigating which Akai Reel decks these will fit. We do know it will fit the above listed decks. This is a "work-in-progress". 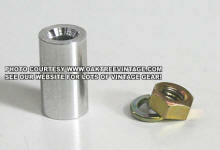 As soon as we discover additional models that this sleeve will or will not fit, we will post that info. STUDY THE PHOTOS CLOSELY TO DETERMINE THE FIT FOR YOUR DECK. We know these do not fit X-150D, 1700, 1710-W, X-1800SD, 1800-DSS, X-2000S & X-5000-W models and Robert's model 1680 / 1725 8L III, 770X 771X SS. or the "M-" series as they use a different sleeve.